I’m not trying to stress you out about there being only 155 days until Christmas. Besides 155 is a lot of days and even though I have the best of intentions regarding Christmas shopping I never get it done before December. I just needed to try this stamp out with some bister because I thought the two would be happy together. 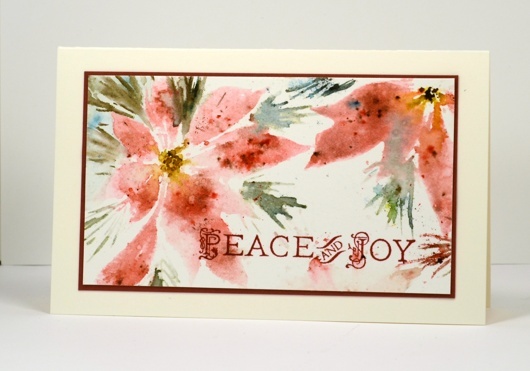 I stamped the petals only in spun sugar distress stain to get a pale impression then sprinkled some red bister into the ink. It takes several re-stampings with water to get the colour to spread around the petals so I used the misti. I then moved onto the pine needles by stamping with bundled sage and dropping green bister. The centres of the flowers are yellow bister and black marker. The panel started out bigger than this with a third shadowy flower at the bottom. I stamped the sentiment in crimson red versafine ink because the stamp has those nice little details and versafine does a great job with them. Versafine also takes longer to dry than dye ink so it is important to walk away, just walk away and let it dry! I didn’t. To my credit I managed to get the whole card stuck together without smudging the wet sentiment only to swipe my fingers right through it when I folded the card base in half at the end! Hmmm…I quickly took it apart, trimmed off the smudged bit, restamped the sentiment and walked away. OK – I give – I will just hire you to make all my Christmas cards. Your written descriptions are wonderful, but I am so visual – I can never seem to get the timing down right, and I get an epic fail. Or at least dissappointing result. Please please do a video….you would save me tons of watercolor paper, and ink. I agree with the previous comment. I’d LOVE to see a video of you doing this. You are always so creative and your cards are always BEAUTIFUL! Oh, Heather, this is beautiful, and I love the amazing results! I so appreciate reading your successes (and how you overcome the oopsies – that we all make! ), but it is truly a beauty! I have yet to play with Bisters (no less purchase any), but you sure continue to tempt me. At this moment I too am working on my first Christmas card (yay!!). Thanks for continuing to inspire and share your experiences with us. I so appreciate it. And someone is going to LOVE this card! Hugs, sweet friend! Gorgeous…but would love a video of the process (and Misti use), too! Love the Bister so much that I had to go and get the colour burst from Crop a While. Do you prefer one over the other. Are there any pros and or cons? Gorgeous holiday card. Love it. I would love to see a Bister video showing this technique and some of the others, where you are getting the perfect marriage of stamped image and Bister! I have these powders but I am not happy with the effects I’m getting, I lose the image or make mud! The two were definitely happy together. 🙂 What a pretty poinsettia card!